What you see above is a shot I thought I would never be able to take. The subject is Capelinhos, a volcano located on Faial Island in the Azores. I have been there quite a few times but, as my pictures were never really satisfactory, I ended up thinking there was no convincing composition possible for that spot. Of course, that was a silly thought. You know how it goes... you search the web for images of the place you are planning to shoot and, usually, you quickly find a whole bunch of amazing ones. Well, with all respect, that was not the case for me with Capelinhos, giving me a second reason to believe the volcano was way more dramatic than it is photogenic. It goes without saying that I was soon to change my mind. For my birthday this year, my wife Dania booked a 2-night stay very close to Capelinhos. Guess what? Having two sunrises and two sunsets at my disposal made it a totally different ball game. Good question. 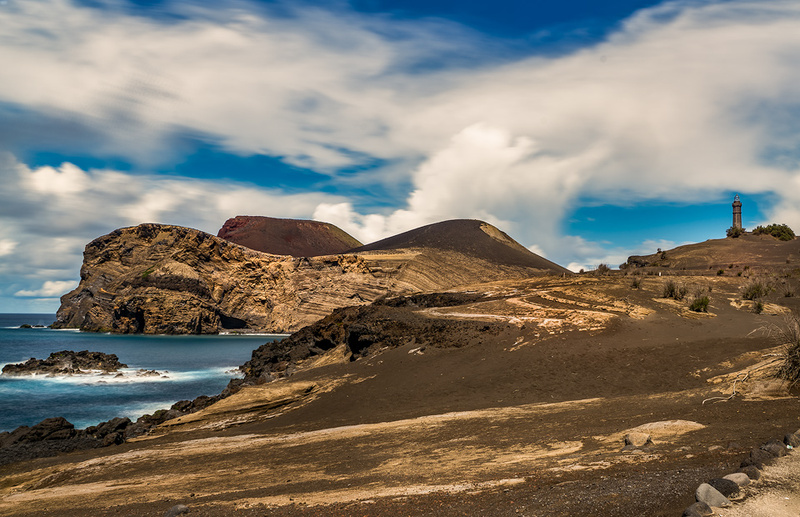 The answer is that I always had to catch the last ferry to Pico after my shoots in Faial. The important point here is not that the golden hour is a much better time for photography. We all know that. What I am trying to say here is that light is absolutely everything for Capelinhos and I guess it has to do with its monotone colour in daylight. While the image above sells reasonably well locally as a postcard, I do not find the foreground nearly as interesting as the one I picked for my April 2017 shot. Yet, I had to include quite a lot of that foreground in the picture, since I needed to be far enough from the subject to keep both the volcano and the lighthouse in the frame. As an alternative, I could have had the sky filling 2/3 of the frame from the top, leaving just 1/3 for the volcano and the lighthouse. But then again, the sky was not so interesting that day at 1pm. I should have moved more to the left and include more water in the frame. I should have shot wider. I should have looked for a more interesting foreground, such as rocks and boulders (as in my best shot of Capelinhos). I should have shot lower (to make those rocks and boulders more interesting). Easier said than done, right? But once again, light is absolutely everything for Capelinhos, no matter what composition you choose. The place looks very dramatic and almost scary. You walk around and it does not take long until you realise that something apocalyptic happened there. In 1957-1958 the volcano erupted for 13 months in a row. It all started with a submarine eruption and then involved lava bombs, pyroclastic clouds as well as lava streaming into the ocean. A new island even emerged off the cape, which sank again in the Atlantic Ocean shortly after. Although there were no casualties, thousands of people had to leave their homes. In 1958, the United States of America helped through the so called Azorean Refugee Act, by authorising the emigration of 1500 people. Among the Congressmen sponsoring the act was a young Senator of Massachusetts named John Fitzgerald Kennedy. The first floor of the ruined lighthouse you see in my shot is still completely buried in ashes and sand. 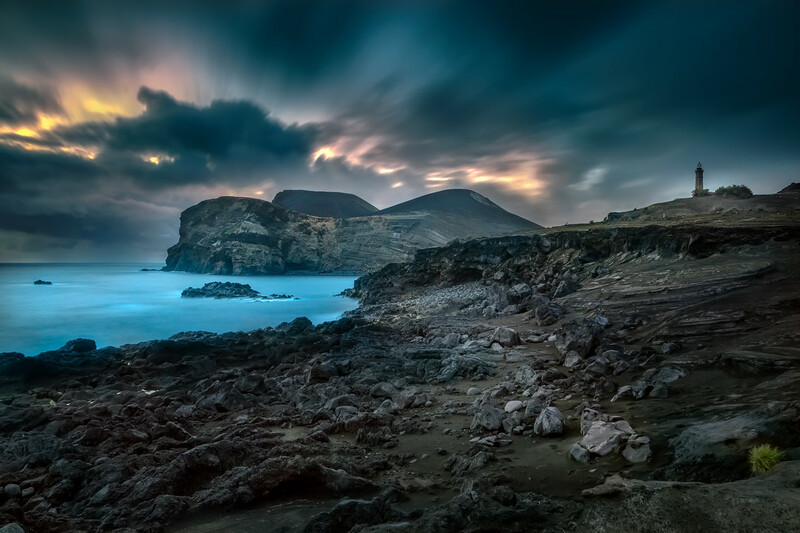 Considering that Flores (the westernmost island of the Azorean archipelago) lies within the North American plate, the volcano of Capelinhos can be considered the westernmost point of Europe. Back to photography, apocalyptic landscapes and warm tones do not exactly go hand in hand. 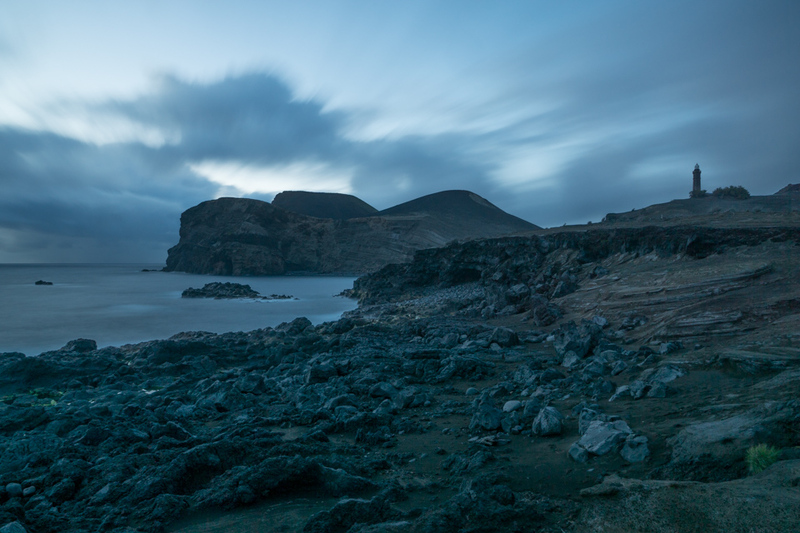 Indeed, I do believe the best time to shoot Capelinhos is on the edge of the blue hour (for the non-photographers, it is the time after sunset when everything gets a blue colour cast). The story behind this shot would not be complete if I did not mention that I actually had a big issue while I was there: I assumed that any of the long exposures I had taken would be long enough to have the dark foreground decently exposed. Well, I was mistaken! After I exposed for the sky and bracketed two stops higher for the volcano and the rocks, I was ready to get my camera off the tripod and go home. Since I shoot raw, this is normally enough to have details in the darkest parts of my images. 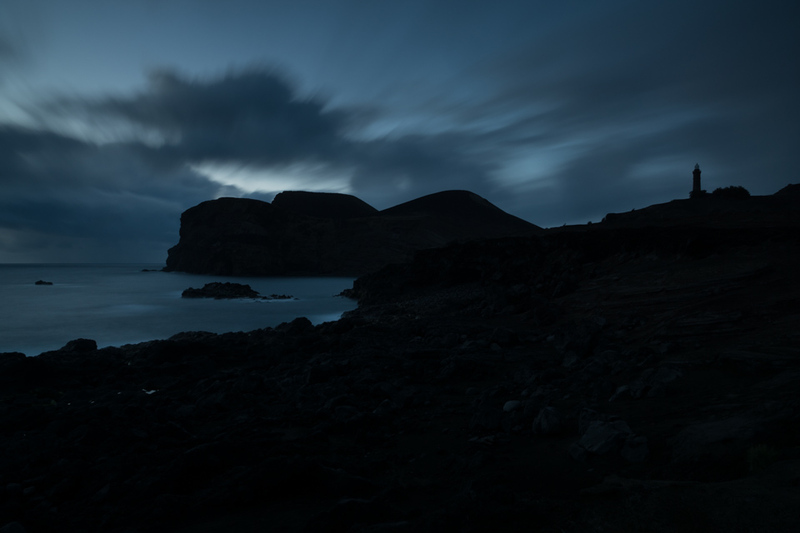 What I did not consider is that I had never shot before as dark a subject as Capelinhos in twilight. Luckily, I have the habit to double check the histogram of my shots before I wrap up a shoot and, sure enough, it was evident that I had constantly clipped the shadows to such an extent that I would not have been able to recover a clean, reasonably noise-free foreground from any of those exposures. By that time the sunset was well over and it was getting very dark very quickly. Drama! What to do? Give up? Of course not. Landscape photography is all about surviving tonnes of frustration to rarely capture a milligram of magic. In the end, it was not that bad and I managed to save my shot (and birthday!) with a 72-second exposure in increasing winds. I am extremely happy I was able to get the best of both the golden and blue hour on the evening of the 16th April 2017. That made it indeed a very Happy Birthday! Below is my final shot, which is a blend of two exposures followed by more post-processing (including setting the white balance, as it is completely off in the image above). The picture is available for sale as print, wall art or digital download. My very patient blog readers can get 20% off anything they buy in my portfolio website just by entering the coupon code enricophotoblog2017. Click the image to access it on my Portfolio Website. What a birthday present Dania gave me. Once again, I must thank her for a shot I would not have taken otherwise.